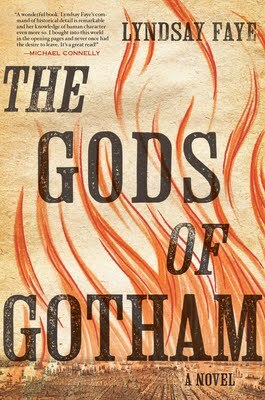 A couple of weeks ago I was raving about Lyndsay Faye's The Gods of Gotham. I noted that "Faye brilliantly captures the heart and soul of the seedier and more dangerous side of New York in the 1840s." This giveaway is open to anyone with a U.S. or Canadian mailing address (no P.O. boxes). Just fill out the following form. I'll pick a winner on April 15 via a random number generator. I have heard so many good things about this book, but I hadn't stopped to pay attention to what, exactly, it was about. Great trailer for this one, and I'm really not a huge book trailer fan. Oh exciting, you're review was so compelling I was seriously thinking of caving and buying it (as if I need more books in my TBR pile right now!). I love a book with great historical tone. This would make a nice donation to my local library if I should win! Loved, loved, loved this book! I wish a lot of luck to the entrants in your contest. It's an awesome read! I'm very curious about this book. Thanks for offering the chance to win! Even though the word "sequel" floating around has me a bit leery, I cannot resist the hype around this one. Heard so much about this book thanks for giveaway. What a great giveaway and I'm in since you raved about the book. The Gods of Gotham sounds fantastic! I just added it to my TBR list on Goodreads. Keeping my fingers crossed!